Sunday Village Markets are Flourishing at Dancing Rabbit. Greetings from the heart of ragweed country! This is Ben, living the dream here at Dancing Rabbit Ecovillage, here to fill you in with all the major happenings around these parts, not that I have a clue as to what’s going on. Here’s a look at the weather: The mornings have been awful chilly, resulting in high sorghum syrup viscosity. The days have been cool and dry, ideal conditions for building a strawbale house, which some of us are doing. Each morning and evening I peer down in the bottoms as poofs of mist materialize, leaving naught but a single dewdrop on every grass-blade by 8:30 AM. Cicadas buzz consistently, and oft heard is the fine whine of skeeters caressing the nape of my neck. Ticks seem to be below average for this time of year, but I can report with much certainty that the chigger population is steady, participating and contributing to the great web of life in their own unique way. It looks like our family computer is broken. I’m not mourning this much, seeing as though we pretty much liberated it from the trash when we got it, it smells like hot plastic when I use it for more than an hour, and hurts my eyes and neck. Right now I am using the commonly shared computer. If I never have to purchase resource-heavy electronics solely for myself again, I will be very happy. Now some folks around here use modern personal computing technology a lot, and in fact without it I suspect Dancing Rabbit wouldn’t exist as it does, or at all. Like a lot of technologies it has its benefits. With a computer, a person can communicate half-way around the world, access an abundance of information (some of which may be true), or play Minesweeper. Computers use less paper than books, but more neodymium. In our common recycling area, we have a space set aside for the recycling and disposal of irreparable electronic doodads. Much like highway driving, I just take it as a matter of blind faith that this whole arrangement works and that somewhere there are pallets and pallets of computer monitors being broken down to their constituent materials and re-purposed. I wonder how much energy it would take to responsibly handle the global volume of e-trash produced by personally owned and operated electronics versus how that would break down if each of us shared our electronics with at least a dozen people. The problem is, I’d probably need a computer to figure out the answer to that. Having already replaced a lawnmower with a scythe, plumbing with buckets, and cars with bicycles, I may as well go get an abacus. In matters which are perhaps more visceral, Dancing Rabbit was visited by some cows a few days ago. I remember hearing the grunting moos before dawn, but in my semi-asleep state I just assumed that the tallgrass prairie was regenerating so well that bison had returned. I awoke, thought to myself, “Those are loud cows.” and went about my day, which usually consists of moving heavy buckets. Then I got the news that some cows had trespassed over the fence, and and a line of ecovillagers, some of whom surely have never herded cattle, amassed to rectify the situation. I remember viewing from a distance someone who was carrying a long, thin oak stick, presumably to enforce some boundaries with the bovines. I don’t know much about cows myself, but I know that on my Uncle Shed’s farm they use a much stouter, bigger stick than that. After what felt like an impromptu land walk, where I questioned our collective abilities to handle this situation we made our way to Thinsoil Prairie, near where a couple dozen cows stood, chewing cud. I was tucked behind a tall stand of bluestem grass, my standard fallback position. I didn’t really know what was going on, but neither did anyone else or the cows. In the end, it took a four-wheeler to handle this situation, but I suspect that a miniature donkey would have been the more sustainable choice. Area man and DR resident Caleb should receive an honorable mention for his continuing contribution of being the person most likely to sneak up on large animals. Rae and Illly are beginning their timberframe construction workshop this week. Though I personally will be a little too busy building a different house to participate I look forward to walking past now and then to view progress on the project. It seems like the workshop model is a good fit for some projects in the village. Being able to simultaneously educate folks and get some work done seems like a rather canny notion to me. If you want to learn how to shovel clay, fill earth bags, haul them, stack them, and tamp them, just let me know. We are working on our root cellar right now, and I just went from that point where earth bagging is fun to where it is extremely tedious, yet somehow new folks walk by every day and want to understand and participate. I don’t think a two-week workshop could be conducted on this building style, but there’s about two weeks worth of work there, at least, so if you want to learn come on by and I will waive your registration fee. I heard on the radio that the back-to-school sales are beginning. I don’t know much about that, as schooling my child doesn’t seem to be in the immediate future, but it got me thinking that Althea, who is four years of age now, may benefit from some slightly more structured learning and doing time. She seems to pick up lots of information without the benefit of a classroom already, so recently I’ve set her to work on hulling cowpeas and mustard seed. She gets to practice counting and finger coordination with the former, and the latter activity, which involves a pinata-like arrangement, is a great opportunity to discuss what is and isn’t okay to beat with a stick. I know that parents ought to be proud of whatever their child creates at preschool, but I prefer having a quart jar of seed for next year to having some sort of paper plate with glitter and cotton swabs glued to it. Another invaluable task Althea is happy to perform is the manufacture of “critter balls”. A critter ball, for the uninitiated, is a new type of garden maintenance technology which was developed in a secret lab somewhere at Dancing Rabbit. All you do is get your bag of seeds, (I prefer a mix of clover, buckwheat, rye and mustard) get your bucket of mud, sort of mix them together, make some nice pellets and let them harden. Then, in the morning, when mobs of greedy sparrows cling to the grain sorghum stalks in my garden I fire the balls with a slingshot, dispersing the feathery looters and effectively cover cropping with little effort. The concept of seedballing has been around for years, most famously practiced by natural farmer Masanobu Fukuoka. I see a future when all the varmint ammunition commonly used on farms and ranches around the world has the lead replaced with hard, biodegradable shot that is impregnated with desired seed, making such common Midwestern activities such as dove-hunting an occasion to also cover crop or improve pasture. Sort of eccentric thinking, I know, that’s why I live here. Like many people this time of year, we are focusing some of our time on preserving the harvest. It turns out that drying, brining, and fermentation use a lot less energy than canning, so our kitchen has been ornamented with many pretty half-gallon jars of various veggies, but has remained less sweaty that tomato season normally turns out to be. Pungent aromas also exist. Sometimes the kitchen situation is a little overwhelming and we lose track of something. I often hear things like, “What’s going on with that bucket of cabbage?” muttered during cook shifts. Lucky for us, most of it tastes just fine. I’ve been drinking a fermented beverage of my own creation. I think I’ll call it schmizzle. It seems to be non-alcoholic, but it is very fizzy, sort of sweet and sour. All you do is mash up some fruit like you’re gonna make jelly and forget about it for a weekend. Tasty and refreshing. Don’t add pectin, though. You can use a yerba mate straw instead of dirtying a jelly bag. If you, dear reader, are not quite sure how drinking schmizzle, making critter balls, and chasing cows are helping to save the planet, perhaps you ought to come here for a tour and find out. Slingshots can only be fired outside of residential zones though. 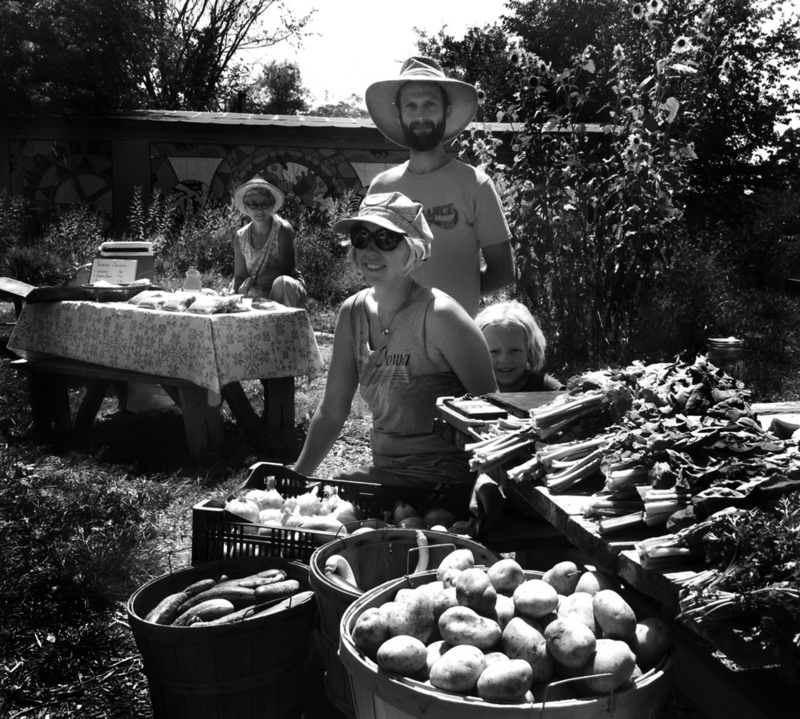 Dancing Rabbit is an intentional community and educational non-profit in Rutledge, Missouri, focused on sustainable living. We offer a tour on the second and fourth Saturdays of the month, April through October. The tour starts at 1:00 PM and generally lasts one and a half to two hours. You do not need to make a reservation for regularly scheduled Saturday tours. For directions, call the Dancing Rabbit office at 660-883-5511 or email us at dancingrabbit@ic.org. We’ve been looking at communities for a couple of years now. Thankfully, we were able to come on a Saturday visit and we loved it!! Now, we need to take the next step on our plan of moving towards living in a community setting. We would love to talk with someone personally, by phone at this point, that could answer some of our questions. We love DR!! We are coming September 21st for the 4 hour tour. We woild really like info on how to buy a piece of land! We could be building our home while finishing projects in our current residence. We would need to sell our home to pay off debts. Can someone email me so we can talk!! This has been a dream of ours to live like this for 17 years now but never have found a place! So very excited!! Can someone please email me so I can get some more info before we visit next weekend? So sorry for the delay in reply– we’ve had some organizational changes in who responds to blog posts and your comment fell through the cracks during the transition. I hope you were able to get your questions answered already, but in case not, please use the contact form at https://www.dancingrabbit.org/contact-dancing-rabbit/ and our correspondent will get back to you. Again, apologies for the delay!